At the weekend, M0TAZ and myself took part in the first 1.8MHz Contest. We have taken part in these for a few years now, most notably 3 years ago in 6″ of snow, and last year getting the car bogged in the mud. We usually do quite well in the SSB only category, as most participants opt for CW or mixed. Thankfully this year was mild, and not so muddy. The contest runs from 9PM to 1AM, and we used a top band dipole fed with 300Ω feeder. 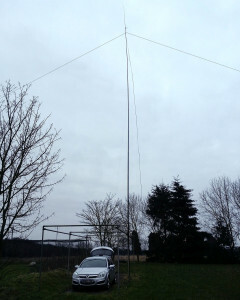 The centre of the dipole was at 60 ft (18m), and was of course 260ft (80m) long. Using an Icom 7100 and 32w (the maximum for this part of the band) we managed to work 60 stations including England, Wales, Scotland, Ireland, France, Netherlands and Germany. Activity from the UK seemed to be low, perhaps due to the contest falling on Valentines day this year.